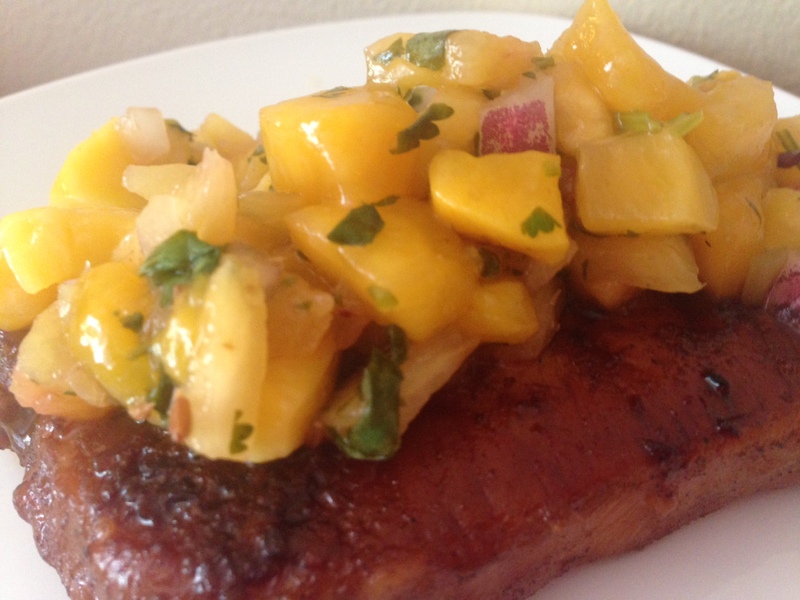 This is now my favorite Go To Summer dish. I am so in love with this quinoa salad. 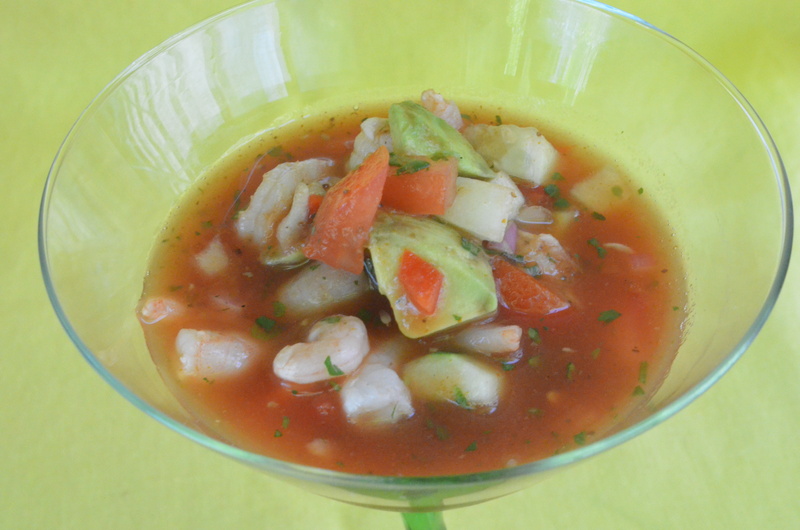 It’s healthy, refreshing, low fat, high in fiber, high in protein and loaded with vitamins. And did I mention it’s delicious! First, I cook the quinoa with chicken broth to give it more flavor. 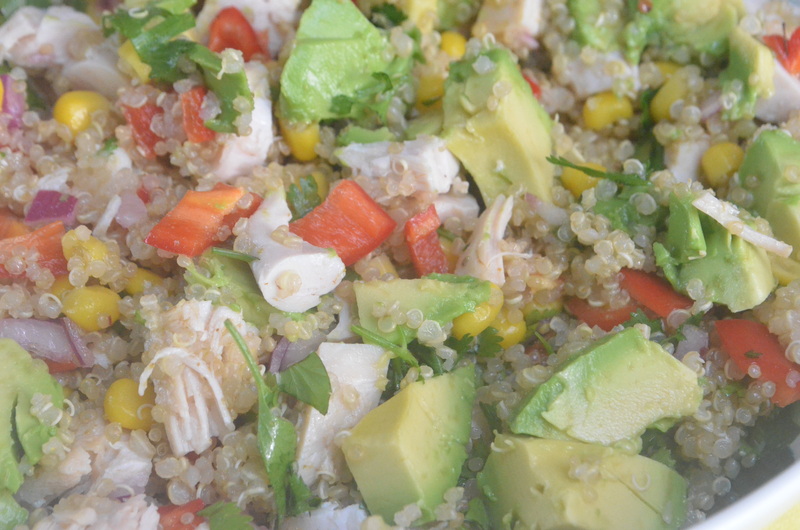 Then I chilled it and tossed it with chicken, cilantro, red bell peppers, corn, avocado and a lime-cumin vinaigrette. Sliced grape tomatoes are a nice addition and so are black beans. I actually thought I had black beans when I made this and when I realized I didn’t, was too busy to go to the store, so I made it without. Anyway, this is perfect for lunch as a main course; as a side dish at a picnic; or as a light dinner. For the quinoa: Bring quinoa and chicken broth to a boil in a medium pot with a tight fitting lid. Let it boil 3 minutes, cover with lid and cook another 15 minutes. Quinoa is done when a hook is released from the grain. Chill for later. To prepare: Chop chicken, red bell pepper, onion and cilantro and place in a medium to large bowl. Fluff the quinoa and add it to the mix. Drain corn and black beans (if you’re using those) and toss with quinoa. Then pit your avocado and chop. 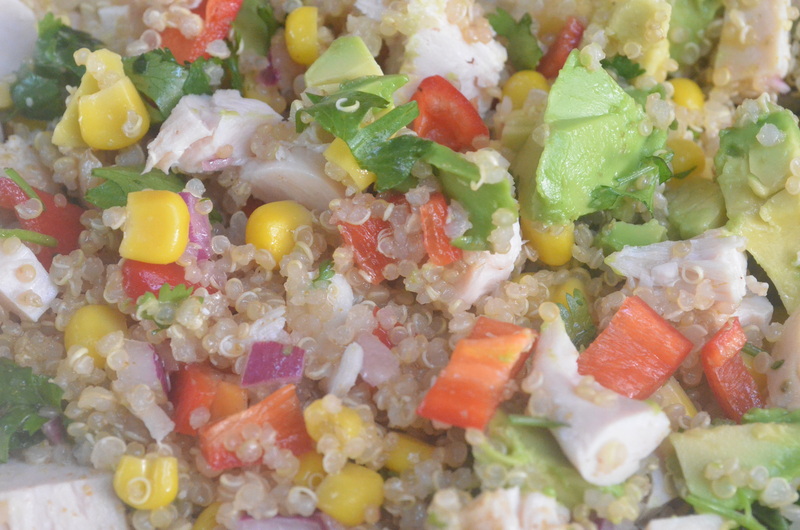 Whisk the dressing ingredients together and pour over quinoa. Toss to coat and serve. If you are making this ahead of time, leave the avocado off until the last minute. Note: This recipe is also good with about ½ cup halved grape tomatoes, too. 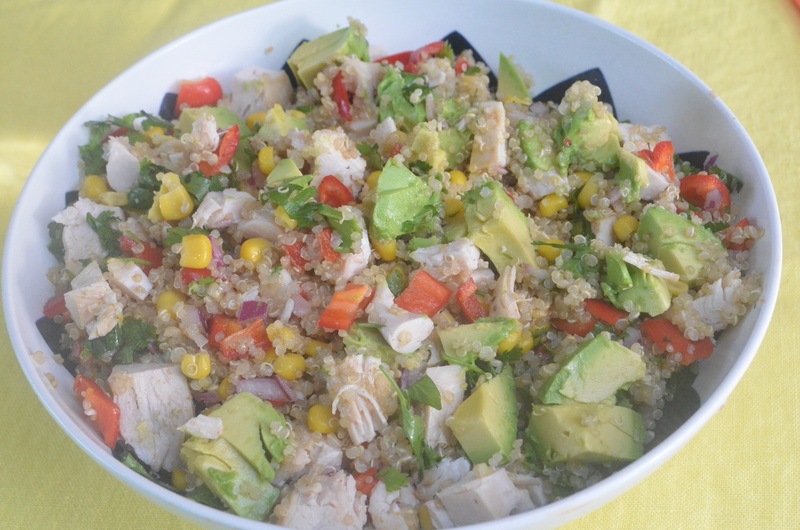 This entry was posted in Juliana's Favorites, Main Courses, Salad, Side Dishes and tagged Black Beans, cilantro, corn, cumin, dinner, healthy, high protein, lime, lunch, office lunch, picnic, quinoa, red bell pepper, rotisserie chicken, salad, side dish, summer on June 25, 2015 by Juliana Goodwin. This chicken sandwich is crusty on the outside, gooey on the inside and packed with flavor. If you love artichoke dip at parties, you will LOVE this. 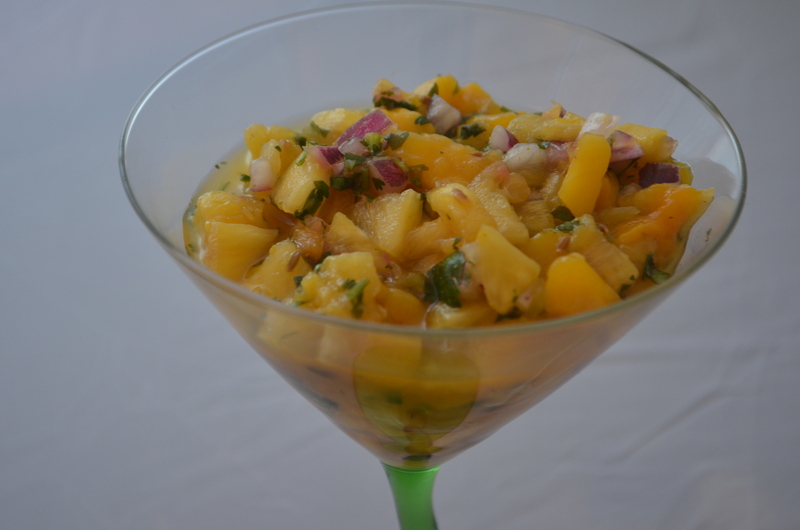 This recipe can easily be doubled and you will want to once you taste it. It’s one of my favorites. 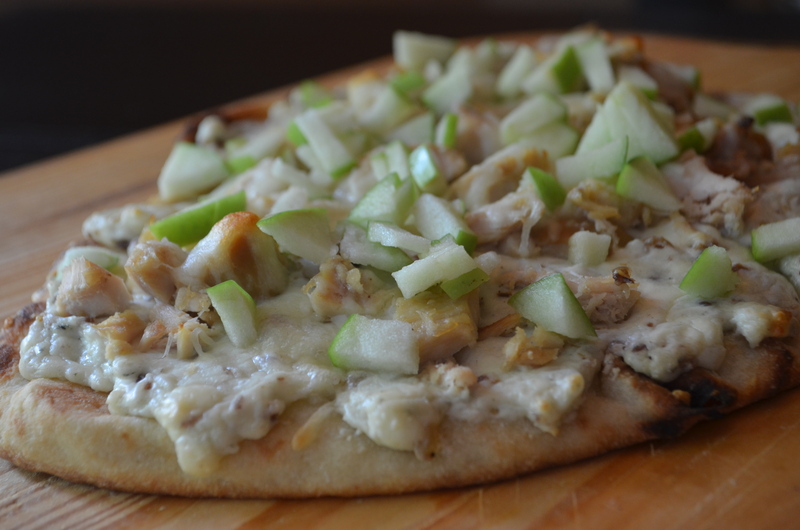 Stir together chicken, cream cheese, mayonnaise, olive tapenade, artichoke hearts, Parmesan and Italian seasoning. Set aside. Cut the bread in half and then cut it horizontally. Fill the bread with chicken mixture. If desired, add a tiny sprinkle of more Italian seasoning. Wrap the loaf in aluminum foil and pop in the oven for 18-20 minutes. When it’s done, cut into four servings. 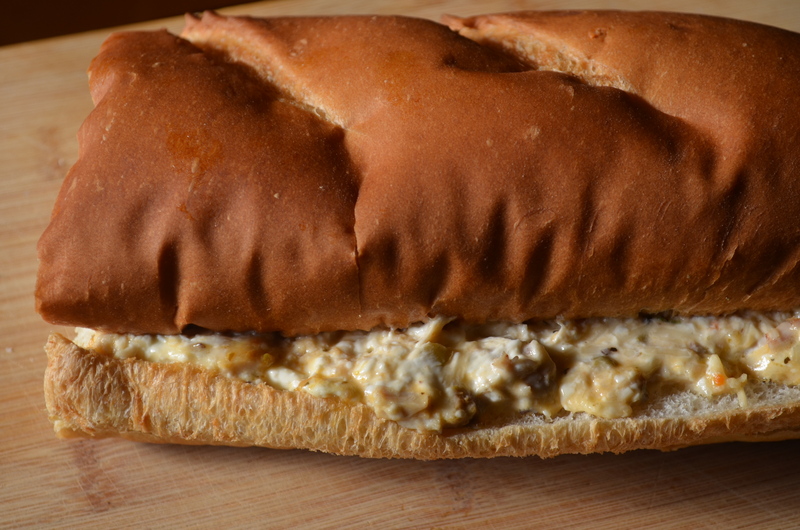 This entry was posted in Juliana's Favorites, Sandwiches and tagged apppetizer, artichoke, cheese, delicious, dinner, easy, lunch, quick, rotisserie chicken, sandwich, simple, tapenade on April 21, 2015 by Juliana Goodwin.